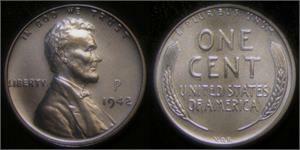 The “1942-P” over-strikes are produced on zinc-plated steel cents of 1943. The steel composition was first used in 1943 so that more copper could be diverted to the war effort instead being used for coinage. The over-strikes stick to a magnet just like the 1943 issue. For additional identification purposes two identifiers have been added to the over-strikes: a large “P” mint mark above the date, similar to the large mint marks used on the nickels of 1942-1945 (no original Lincoln Cents were ever minted with a “P” mint mark prior to 2017); and a “V.D.B.” reverse (no original Lincoln Cents were ever minted with a VDB reverse after 1909).